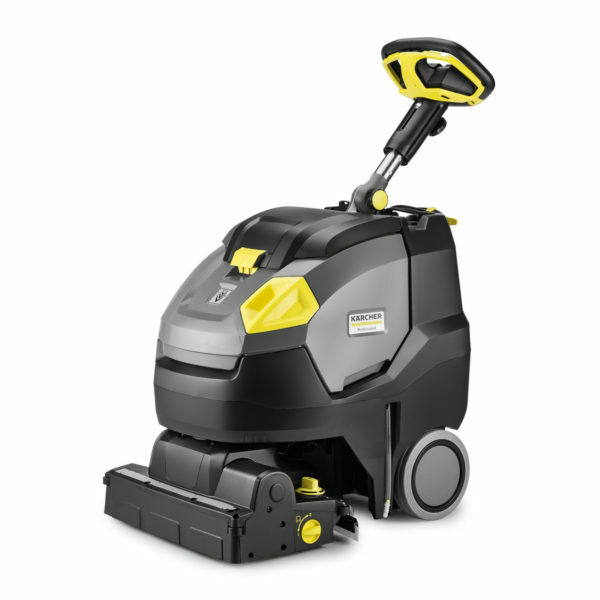 Fully equipped, battery-operated compact scrubber drier. With rotating roller brush head and KART steering technology for maximum manoeuvrability with a large area performance. Even large spaces often have to contend with the odd narrow area or cluttered furniture. Our BR 45/22 C Bp Pack scrubber drier is the ideal choice for these challenging situations . Equipped with a roller brush head which rotates 200° in either direction thanks to KART steering technology (Kärcher Advanced Response Technology), it delivers a large working width combined with exceptional maneuverability – ideally suited to highly cluttered floor spaces. At the same time, the positioning of the brush and squeegees – which are always aligned to match the direction of travel – ensures an increase in the area performance and a uniform cleaning result. Our built-in, high-power lithium-ion batteries offer a up to 3x longer lifetime than conventional lead batteries and are also completely maintenance-free. Using the innovative eco!efficiency mode can increase their run time even more significantly as well as reducing operating noise by around 40% – ideal for daytime cleaning. The optional HEPA filter removes the exhaust air from the dirty water, allowing you to work in hygiene-sensitive areas. Enables extreme manoeuvrability of the machine, even in areas with a lot of furniture and when negotiating curves. Cleaning and vacuuming in reverse is easily possible. Maintenance-free and with a service life that is up to three times longer than conventional batteries. Partial and opportunity charging is possible. Reduces energy use and extends the run time of the battery by up to 50%. Energy savings also reduce the total CO2 “footprint” of the machine. Makes it possible to drive away from walls at a 90° angle. Suitable for transport in small vehicles. Charging the battery is possible at all times.